I have to say I’ve often been lucky enough to work with writers and artists who understand comics, and what I need to do my part of the job. Here are a few examples. Above, two panels from DC’s DEAD BOY DETECTIVES. 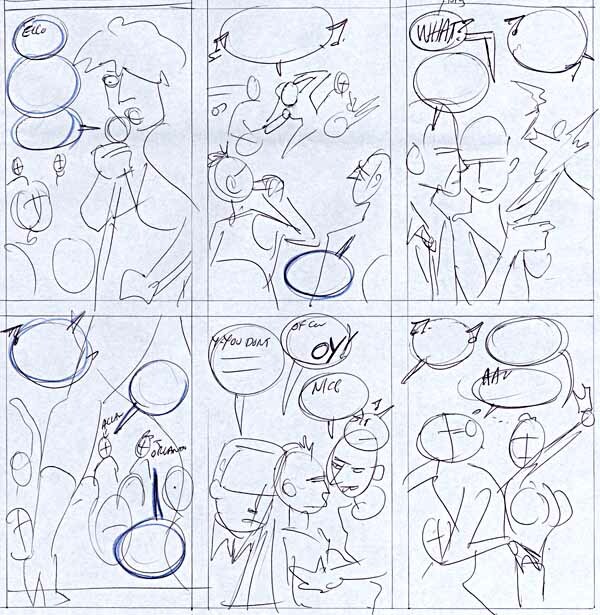 Artist Mark Buckingham does layouts in pencil, and often lightly indicates where lettering should go. Either the editor or assistant editor marks up a copy of the pencils with clear marker indications for placement, usually following Mark’s lead. The storytelling is clear, so when I get the finished art by Ryan Kelley I rarely have trouble fitting the lettering in where requested, though I will move it around if I need to, as in the second panel above. These two images © Alan Moore and Kevin O’Neill. Here’s a section from THE LEAGUE OF EXTRAORDINARY GENTLEMEN: CENTURY: 1969. Often artist Kevin O’Neill will mark balloon placements on a photocopy of his finished art, but on this page he didn’t have time to make a copy, so he put a sheet of tracing paper over the art and rough-sketched a layout with balloon placements. This is fairly complex storytelling, and quite a few balloons, but Kevin knows how much space to leave, and I was able to get everything in as requested. Finally here’s an example of an artist going above and beyond the call of duty! For TOM STRONG’S TERRIFIC TALES #11, artist Bruce Timm did a story featuring Tesla Strong. For lettering placement, he sent me photocopies of his finished art, and taped over it were his own hand-lettered balloons! Bruce made it very easy for me in this case, even with fairly heavy dialogue in the last two panels. And I had fun lettering the story in the style of Ira Schnapp to match the 1950s feel of the piece. By going the extra distance, Bruce Timm has sort of recreated the way comics were laid out by the artists when I first began lettering them, except that I couldn’t letter it with pens and ink, as I did back then. While I don’t think artists today need to go this far, they and the writers both need to think about how and where the lettering will go to help tell their stories. Great post, Todd! Most people don’t realize how important word balloons are to the outcome of the final art. On the surface they have to look good, since they’re what people will be reading. For example, I’ve never seen a story lettered by Ben Oda or Tom Orzechowski that wasn’t enhanced by their lettering, and many times these books suffered if these guys left or there was a fill-in letterer (In particular, Creepy magazine became almost unreadable to me after Ben Oda was replaced). My primary artistic duties are penciler and inker, but I have done lettering before. And I learned very early on that you always need to leave space for lettering, and also make sure that the balloons work well compositionally. To this day the first thing I do when I get a script is lay out the panel shapes and lettering before I even draw a single figure or object. This is especially important if I’m unsure of another letterer’s skills so that I can ensure they don’t screw up the compositions or page flow with bad placement. I also have to say that I’ve been seeing tons of horrible balloon placement in Marvel and DC books recently. I understand that it’s easy to move around and alter balloons digitally since they’re not “tied down” to the paper. But I’ve seen tons of negative space remain empty while balloons crowd up areas with a lot of linework, or balloons creating tangents, or balloons which could work being “docked” to a panel border just floating in the middle of the panel, leaving either negative space or covering up information that might be important. It feels like lettering isn’t treated like an art anymore, it’s more like it’s being done as an afterthought because the word balloons HAVE to be there – Just drop them wherever and call it a day. I utterly *loathe* most current lettering. They plop a hundred words in a single oval…just dreadful to look and and laborious to read. That stuff needs broken up into multiple ovals, with important phrases singled out in their own balloons. The balloon placement should reflect the cadence or pattern of the speaker and the conversation. 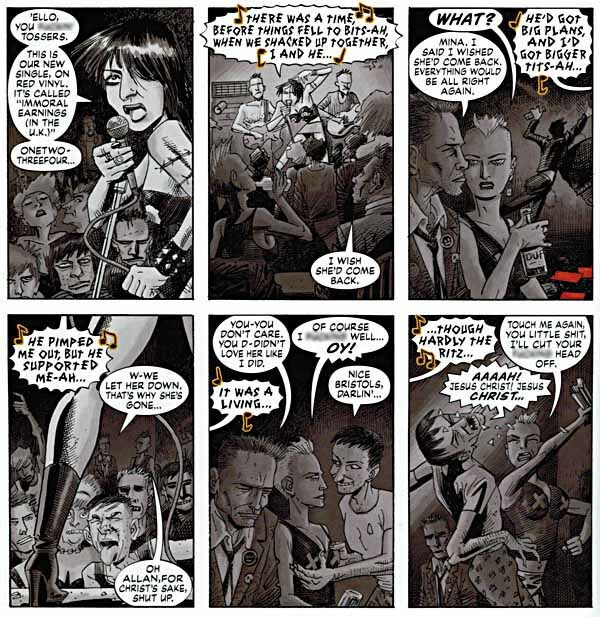 If you’ve read Brian Bendis’s indy work, you’ll see how the flow of smaller word balloons allowed for a lot of interplay between characters in a single panel and replicated the choppiness of human speech. I believe the lettering had a lot to do with Bendis gaining a reputation for strong dialogue. I’ve also noticed that current letterers simply do not attach balloons to panel frames. Whereas Jim Shooter insisted on doing this to a fault (giant panels with ample space still had attached text boxes and word balloons that put the reading too far away from the speakers), today it’s the other direction. I feel that word balloons that overlap multiple panels–as S.O.P., not for effect–jerk the reader out of his immersion into the story. When I read an old Tomb of Dracula story I feel drawn into it because of the way the panels are designed. With today’s lettering, I almost never get that feel. Talking to Joe Kubert (back in the day) he always said he thought it was crazy how artists today will draw without knowledge of word balloon placement. For anything he did he would have the lettering placement done on his pencils/roughs so he had the exact space it would take up so he could reposition his drawing accordingly if needed before going to finish. I’ve followed this advice with all the work I’ve done.